DUSTY is designed to add some style to everyday routine. Vivid colors, light frame with platform, ergonomic constructed frame – it all makes this balance bike so special. Bike is available with 12” wheels and have adjustable height of saet and steerings. 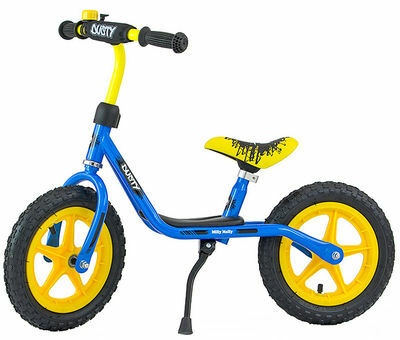 Pneumatic wheels and high quality bearings allows to ride on this balance bike with easy on all pavements. The bike is equipped with a platform which allows to the kid keep its legs on it while fast riding. The kickstand helps to teach the child responsibility for its stuff.